Robert is running for DESERT SANDS UNIFIED SCHOOL DISTRICT Governing Board Member Trustee Area 3 in 2016". He has won the respect and admiration of all of us for making the sacrifice - taking the steps necessary to make our community a better place by running for this office. Signed: Executive Committee & Advisory Board of CCOLQ. As a US Army Veteran, Businessman and Resident of La Quinta, I understand the need to be frugal with YOUR money. I believe government should operate like the private sector. When there is no more money, spending must stop! During these tough times, you have my commitment, as your Councilman, to be fiscally prudent with the taxpayer's money and I will not vote to raise taxes or fees! As your Councilman, my door will always be open to all residents, landowners, developers, and business owners and I will represent you to the La Quinta staff to insure the city is run properly. Bringing a 5 star Hotel, Convention Center, Movie Theater, and Retail to Silver Rock, making Silver Rock a tax generating facility. I am proud that our two sons have been raised in La Quinta and it is very important to me that La Quinta be a safe community with strong family values. Robert F. Sylk: In the Name of The President of The United States Barak Obama and on the highest Recommendation of The Governor of California Jerry Brown, because of your demonstrated patriotism, fidelity, and abilities, you are hereby appointed by the United States Director of the Selective Service System as the representative Board Member for the State of California, and for Riverside County, California. It's a pathetic but predictable part of every campaign season. Small-minded people who disagree with a candidate's yard sign deface or steal it in the dark of night. Defacing signs is a despicable, cowardly act by people who do not have the courage of their convictions to stand up for their own views. I live in La Quinta and have also been the victim of such acts. It is our right to have a choice and it bothers me that people would do this. If you want to support a candidate, do so by putting up your own sign, not taking others' down. Taking a sign amounts to larceny and damaging one is vandalism, both are Class 1 misdemeanors punishable by up to one year in jail and a fine. That yard sign is an expression of the owner's views, as is the written word in letters to the editor. That freedom of expression is protected by the Constitution and is a basic right of all Americans. Let voters have their say with signs of support for their candidates. That is the process that deserves to be protected. Anyone who would steal or deface them is spineless and does not understand one of the most basic freedoms of that process. Every election, The Desert Sun receives reports of stolen or damaged campaign signs. La Quinta mayoral candidate Robert Sylk has an interesting way of trying to deter such activity. Next to a campaign sign at 54th Avenue and Jefferson Street, Sylk sent us a picture showing this notice: "A camera is across the street on a post. If you remove this sign, it is a federal election violation and you will be prosecuted." I am one of those citizen's who has never been active in politics - UNTIL THIS YEAR! Now more than ever we need candidates for office that have proven leadership. Robert Sylk not only has a long successful business career, but his life-long philanthropic efforts are exceptional. He truly cares about his fellow man. I'm very concerned about the direction this great country has taken over the past two years. We need to start locally with support of leaders with passion, expertise, and a vision to get things done. Robert knows how to do this and he also understands the average American. We can no longer wait for decisions. We can no longer have conflicts of interest in local leadership and city leaders. We demand clear, unencumbered elected officials that deliver results and are stewards of our taxes. Robert has offered a 10 Year Plan for La Quinta, since 2008. Special interests and testing the direction of the wind before making decisions that will benefit La Quinta need to stop. Robert Sylk is the leader to forge a new direction and leadership for our great city. From the beginning of this campaign, I asked La Quintans who believe in a new vision for our city to join me. I have been amazed over these months by the enthusiasm of your response. Your time and energy were important to energizing my campaign. To the hundreds who cast their votes for me, I thank you for your support, and I thank you for your belief in our vision to build a New La Quinta and your confidence that we can change the direction of the city we love. I could not be more proud of the campaign we ran. I gave it my all and so did you. Yes, we came up short, but certainly not for lack of determination and a very clear vision for making our city better. I wanted this campaign to be something different, engaging neighborhoods that are often overlooked and on that score we succeeded. The journey has now ended, but the mission has not. If you truly care about La Quinta's future, I have one more request of you. Let's keep working. Thank you again for being part of this most wonderful effort. "My Ideas for La Quinta"
Also appeared in The Desert Sun August 15, 2010 as "The Letter of the Week" and generated with a follow up article over 141 responses. People who never even thought of politics are becoming engaged in their local towns and cities. I finished reading the Constitution and the Declaration of Independence, and now reading The Federalist Papers (complicated). One thing I know for sure, the Founding Fathers never could have envisioned what is going on today. They wrote for their times, and I am sure would be mortified if they heard what "free speech" entails today. They were men of faith and decency, and free speech meant free to exchange ideas, free to speak your mind without fear of reprisal, free to speak about new directions in government, etc. I am sure they never meant free speech to mean singing about downgrading your mother, or harming police. There was a time in this country when you would have gone to jail for those words, instead of given a stage to shout it from. Politically correct is a joke; we have gone so out of our way not to offend anyone, that we have forgotten the rights of the everyday American. Washington needs a major overhaul. I feel strongly about our country, THE GREATEST COUNTRY ON EARTH, and I would like it to stay that way. Abel Maldonado with Robert Sylk. 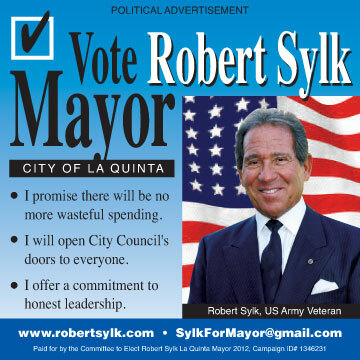 A campaign poster for La Quinta city council candidate Robert Sylk is posted along Fred Waring Drive in La Quinta on Friday, September 12. The sign touts Sylk as a republican even though he is running for a nonpartisan office. (Crystal Chatham, The Desert Sun) Robert Sylk's 2012 Mayoral election campaign sign. Candidates in nonpartisan races are not allowed to put their political party on the ballot. But that's not stopping them from making their affiliations known to voters. 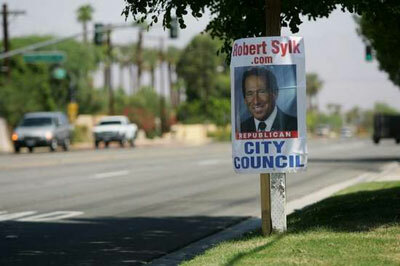 In La Quinta, candidate Robert Sylk proclaimed his GOP ties on campaign yard signs. It's a different approach from when Sylk ran for council two years ago. But he says it has nothing to do with the fact that the city is considered Republican territory.